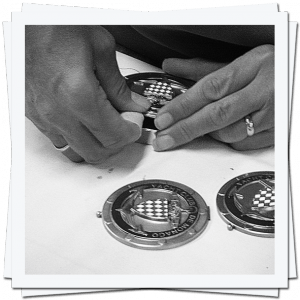 The quality of our products is controlled all along our manufacturing process. However, some small defects on the metal may appear only after the surface treatment. That is why the quality control workshop, at the end of our process, is a crucial step that guarantees the quality of all our creations. After this control, medals, trophies and insignias are packed in a cardboard box, a jewellery case, a plastic sachet or a velour pouch according to the customer’s order. The packages are then carefully prepared in order to make sure that our products and their specific packaging reach our customers unharmed.